The spoof version, released by the Yes Men to great effect, has the fake Fink say his company will do an about-face on the climate crisis by divesting from coal and aligning its investments with scientific greenhouse gas reduction targets. Fink’s real letter calls on companies to take a long-term view — but wholly fails to mention climate change, the single greatest threat the world has ever known. Yet, if you look at BlackRock’s actual investments, you could be forgiven for thinking that their purpose is to drive civilization off the climate cliff while profiting from the wreckage. BlackRock owns more fossil fuel stocks than any other company. BlackRock is the world’s largest investor in new coal plants, with shares and bonds totaling $11 billion in 56 coal plant developers around the world, almost double the coal holdings of its closest competitor Vanguard. (Note to investors: this is not just bad for the planet, it is bad for profits.) And it has become notorious for never having filed a shareholder resolution, and voting the wrong way on almost all the resolutions that come across its proverbial desk. If you look at BlackRock’s actual investments, you could be forgiven for thinking that their purpose is to drive civilization off the climate cliff while profiting from the wreckage. Fink’s 2019 letter describes the firm’s investor engagement priorities for the year ahead, which give a nod to board diversity and environmental risks among other things, but the language is so empty of any real content that it provides virtually nothing to hold BlackRock accountable for. And it’s hard to have confidence in BlackRock’s commitment to responsible investment stewardship when it has the single worst record of any asset manager on shareholder engagement around climate action. Just a few days before Fink released his letter, twelve leading shareholder advocacy groups and socially responsible investment firms called on BlackRock to align its own business practices, and its voting practices, with the goals of the Paris Climate Agreement. — Coincidentally, this is the same thing the Yes Men called for in their hoax letter. So, which is the greater hoax, a joke letter from a bunch of pranksters, or the fact that the CEO known as ‘the new conscience of Wall Street’ oversees stocks in more climate-trashing companies than anyone else? When BlackRock’s new suite of environmental, social and governance (ESG) funds was announced late last year, it brought the firm’s total ESG portfolio to about $25 billion. When announcing the new products, Brian Deese, global head of sustainable investing at the firm said “Sustainable investing is becoming mainstream investing.” And indeed, $25 billion sounds like a sizeable commitment to ESG. But do the math and you find that, as a percentage of BlackRock’s overall assets under management — just shy of $6 trillion, according the latest earnings statement — the amount invested in ESG comes to a whopping 0.4 percent. Sustainable investing IS becoming mainstream investing. But BlackRock itself, for all its talk, is far behind the curve. To put this in perspective, the US Social Investment Forum has shown that 1 in 4 dollars under management in the U.S. adheres to some kind of socially responsible standard. So Mr. Deese is right, sustainable investing IS becoming mainstream investing. But BlackRock itself, for all its talk, is far behind the curve. 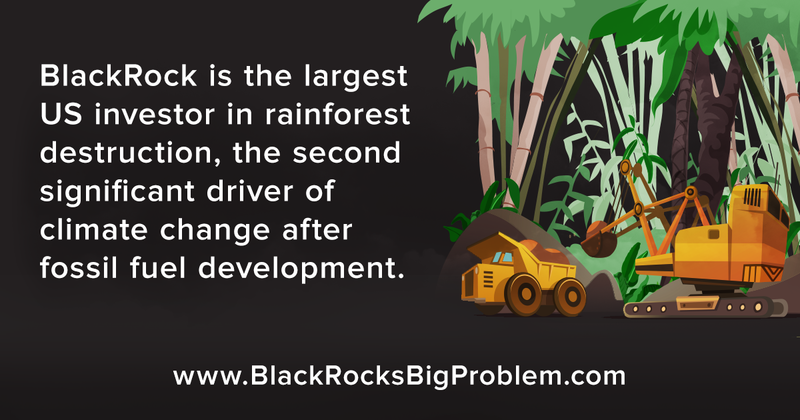 BlackRock’s climate problem is not limited to fossil fuels. The world’s largest investor in fossil fuels is also the U.S.’s largest investor in tropical deforestation — the second leading contributor to climate change. This single iShares fund, for example, has $21 million invested in Wilmar International — the world’s largest palm oil trader, whose business has helped drive the destruction of at least 130,000 hectares of Indonesia rainforest in the last four years alone. This iShares fund contains twelve conflict palm oil companies, including about $110 million in the Korean giant Posco and Posco Daewoo, whose subsidiary recently destroyed an area of rainforest six times the size of Central Park. And then there’s this iShares fund — one of BlackRock’s vaunted ESG core funds — which has another $3 million in the same Korean rainforest wrecker. A number of BlackRock’s ESG funds also have significant holdings in big agribusiness firms like Bunge, which was recently hit with penalties for tearing down native forests in Brazil’s fragile Cerrado ecosystem. All of this is why it should be abundantly clear that Fink’s over hyped letter should not be mistaken for action. With the 2019 shareholder season coming up, BlackRock’s big problem is putting its money — all $6 trillion of it — where its mouth is.